During the First and the Second World Wars, many ships were camouflaged with Dazzle Patterns. This was true for both the Merchant Navy as well as for the Military Navy. Vessels from both the UK and the US were camouflaged. The Rhode Island School of Design has a fine collection of cards describing various camouflage patterns used on American merchant vessels during World War II World War I. Some 50 of the cards can be seen here at the RISD Fleet Library: Special Collections. Overall, the library holds 455 plans of both the port and starboard sides of 10 types of merchant vessels – including multiple designs for each of those ships. I didn’t have an example of a merchant vessel in dazzle and the US Navy’s Historical Center website was off the air when I was trying to write this piece up. These plans were donated by Maurice L. Freedman who was a camoufleur during the Second World War, organising the painting of ships on behalf of the U.S. Shipping Board, Emergency Fleet Corporation. The US Navy provided the dazzle plans originally. The “Bedazzled” exhibit runs in RISD’s Fleet Library from 26 January 2009 to 29 March 2009, so hop into that website and check it out now before it gets taken down again. The Freedman artwork you mentioned is a collection of World War One camouflage designs, not World War Two designs. I'm not sure Freedman was a naval camoufleur during WWII–maybe you should check this. Does RISD actually hold 455 plans of ship camouflage designs? In paragraph 3, what does "0 including multiple designs. . . ." mean? Maurice L. Freedman donated the plans and photos in the collection of the Fleet Library at RISD. Maurice was the district camoufleur for the 4th district of the U.S. Shipping Board, Emergency Fleet Corporation … According to one of the photos from our collection, the SS Everglades was the first ship launched in the U.S. already camouflaged July 29, 1918 in Florida. Our collection [RISD] consists of 455 plans (includes port and starboard sides of a ship) and 20 photos. There are 10 types of merchant ships represented with multiple designs for each of those ships. That "0" in paragraph 3 was a typographical error caused by fat fingers coupled with rushing my own proof reading – it should have been a dash (-). 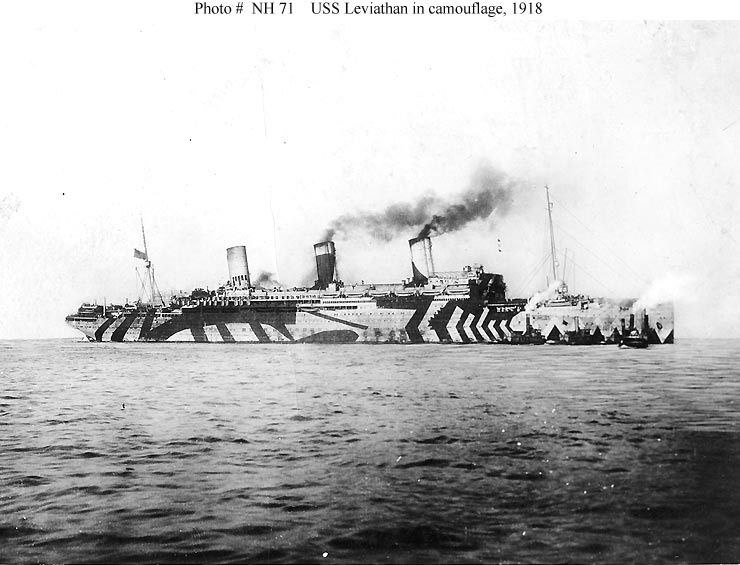 I should also note that the image of USS Leviathan in dazzle camouflage in 1918 was added to the post a little time after I wrote the post.